My son Kevin and I are new member to SD Anglers and only started fishing in late December 2015. We recently did a full day trip to Catalina Island aboard the Fury out of Dana Wharf Sportfishing. This is a picture of Kevin’s first Yellowtail. There we many older and experienced fishermen on the boat with expensive gear and years of knowledge. They were all fly-lining with 1/8 ounce weights and live Anchovies or using surface iron jigs. 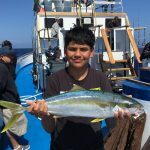 Kevin was bottom fishing with a dropper loop and a strip of squid, and he caught first and largest Yellowtail that day. 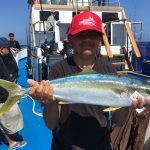 Overall about 40 Yellowtail were caught that day.